A court in Zimbabwe has convicted a popular self-styled prophet of fraud and fined him $700 for falsely claiming he had a herbal cure for HIV and Aids. Police arrested him in November, and seized a herbal drug which he said could cure people who had HIV and Aids. Zimbabwe has the sixth highest HIV prevalence rate in sub-Saharan Africa. About 1.3 million people were living with HIV, according to UN data compiled in 2016. The 35-year-old Magaya is among a group of young, brash and flashy religious figures who have emerged during Zimbabwe's economic crisis, attracting a huge number of followers with promises of miracle healing and miracle money, says the BBC's Shingai Nyoka in the capital, Harare. The government branded his claim as criminal, and police raided his offices. 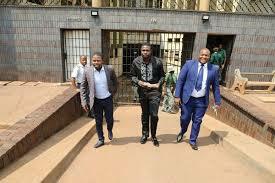 The charge sheet said that just before the search, Magaya and others "destroyed some of the exhibits by flushing them in the office toilets and burning containers which were, however, recovered half-burnt".